Carlos Sainz made up for his disappointment of last year, when he crashed out late in the race while leading. (CNN) -- Carlos Sainz has won the Dakar Rally for the first time after keeping main rival and teammate Nasser Al-Attiyah in his sights on the 14th and final stage on Saturday. The Volkswagen drivers continued their dominance of the South American endurance event, with Nasser Al-Attiyah ending the final leg from San Rafael to Buenos Aires 36 seconds ahead of second-placed Sainz. That was not enough for the Qatari to overcome the Spaniard, whose overall winning margin was two minutes and 12 seconds. The two drivers had clashed on Friday after Sainz was upset by Al-Attiyah's aggressive tactics, but the two-time world rally champion was delighted to seal victory after having led since the fifth stage. "A very, very important day for me. I won in Europe, in Spain and today in the Dakar. I am really happy and relieved," he told the race's official Web site. "I would first like to thank my co-pilot Lucas Cruz for his wonderful work and the team as well as all of those who trusted me for so long. There was no problem at all with the car. There is not a single bump on its body. "We drove very fast, but we were clever too. It was a tough and daily fight against my teammate. I knew it would be like that. I could not afford any mistake. We had to master everything and control our emotions. But it has been like this for a week!" Al-Attiyah, who finished half and hour ahead of third-placed American Mark Miller, also driving a Volkswagen, was philosophical after being denied his first victory. "This second place is a good result for me. I never got this high in the standings. This morning I really went for it but we knew the stage would be a long straight line," he said. "I am thrilled I won the stage. My main feeling is joy. We raced a great Dakar, no mistakes, no problem with the car. It all worked out fine: the team, the co-pilot, the car. We finish the Dakar with three Volkswagen on the podium. 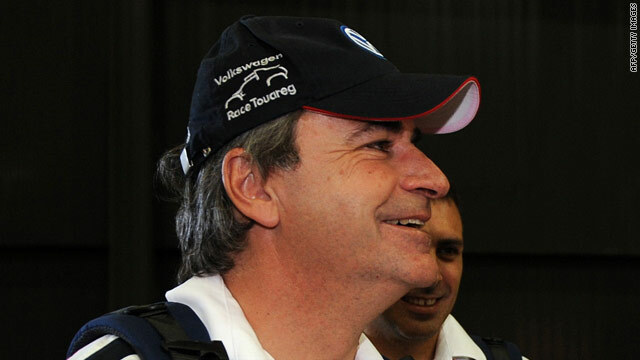 "Congratulations to à Carlos Sainz. What matters is that a Volkswagen won. I am happy for Carlos. He did his job. I tried to do mine. Next year, I'll win. But now I'll go shake hands with Carlos, he's part of the team." France's Cyril Despres claimed the motorbike title for the third time, finishing sixth in the final stage won by his KTM team support rider Ruben Faria of Portugal. Depres finished more than an hour ahead of Norway's Pal Ullevalseter, who was second behind Faria. "We left Lac Rose three years ago in 2007. Since then we have had three tough years, three years of injuries, training, hard times. We can only be moved by this third victory," Depres said. Vladimir Chagin of Russian won the truck category by more than an hour after finishing fourth, while Argentina's Marcos Patronelli won the quad class ahead of elder brother Alejandro.